Figure. Antibody (Ab1) against a gene of interest (GOI) was validated in cell lines in which the gene was knocked out using CRISPR/Cas9. 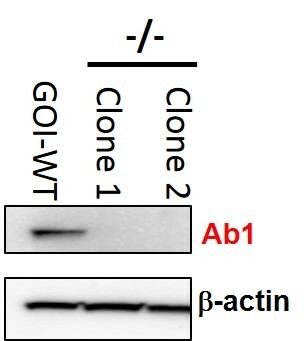 Western blots using Ab1 do not show any binding in protein extracts from clones 1 and 2 of the knockout cell line (-/-); β-actin was used as a positive control for the assay. WT: wild type. Antibody validation using gene knockout cell lines is suitable for: western blot, immunohistochemistry, immunocytochemistry, flow cytometry, ELISA, and immunoprecipitation applications. 1. Affinity Tag knock-in to the gene of interest (e.g. FLAG, V5, Myc) (e.g. FLAG, V5, Myc): Compare binding of the antibody directed to the protein of interest with a tag-specific antibody. 2. Overexpression of the target protein: Knock-in the gene of interest under a high expression promoter into a cell line that doesn’t express the target protein, as a positive control to evaluate antibody binding. These types of cell lines can also be generated using our proprietary TARGATT™ technology which is ideal for site-specific gene integration and highly controlled gene expression in cell lines. Please contact us for more details on generating your knockout cell lines, affinity tagged or protein overexpression cell lines for high quality and reliable antibody validation. Applied StemCell uses two complementary genome editing technologies to generate advanced cell line and animal models very efficiently and effectively: the CRISPR/Cas9 technology and our propriety site-specific gene integration technology, TARGATT™ for large fragment (up to 20 kb) knock-in into a safe harbor locus. Uhlen, M., Bandrowski, A., Carr, S., Edwards, A., Ellenberg, J., Lundberg, E., ... & Yamamoto, T. (2016). A proposal for validation of antibodies. Nature methods, 13(10), 823-827. Bordeaux, J., Welsh, A. W., Agarwal, S., Killiam, E., Baquero, M. T., Hanna, J. A., ... & Rimm, D. L. (2010). Antibody validation. Biotechniques, 48(3), 197.